There are few things that provide an opportunity to engage in city-building and place-making, with high social and economic return on investment than investing in a 21st Century public library as community hub. A 66% increase in program attendance. A 83% increase in number of programs. An 8% increase in circulation. Even higher social ROI returns to the community. The consequences of under-funding public libraries are a well researched area. At the end of this executive summary are a selected long list of independent research studies that show the impact, value and outcomes from public library strategies on their communities. The economic local impact of public libraries in Ontario average $5.41 for every dollar invested by the community. This is a very conservative calculation on economic impact alone. Real estate professionals report that public library branches increase home values (and therefore property taxes) and serve as a locus point for renewed re-development. This has been experienced in, for example, case studies of Vancouver Public Library’s central branch and the TPL Fort York branch. They also attract new businesses and students. 26% of library users using the technologies in the public library to start, manage, or grow their business. 41% of library users using the technologies in the public library made creative products. 45% of library users using the technologies in the public library to develop employable skills. 36% of library users using the technologies in the public library to develop job search skills. 45% of library users using the technologies in the public library to improve their job skills were successful in funding a job. Schools with properly resourced and staffed libraries enjoy a 12-20-point increase in standardized testing scores. Partnerships between school and public libraries increase this by an average of 5 points. This has been confirmed by over 100 studies in the US and Canada. 26% of library users using the technologies in the public library reported an increased level of community engagement. 81% of library users using the technologies in the public library reported an increased level of social engagement. Each of these are correlated with low rates of poverty and cyclical poverty, decreased social isolation, decreased school bullying, and higher access to social services in a non-stigmatized environment, etc. Stronger community and downtown revitalization. The following is a list of Canadian public libraries who have conducted an economic impact study applying this cost-benefit analysis (CBA) model first used by Toronto Public Library in 2013. CBA is a commonly used approach to estimate the economic impact of public institutions. Please read “Understanding Economic Impact and Public Libraries” for a more detailed explanation of how CBA is applied to public libraries. This CBA model is open and available for public use. Ottawa Public Library’s spreadsheet of calculations and data is open for others to use to calculate their own economic impact. This list is maintained by Brightsail Research partner Kimberly Silk. 56% of respondents reported using technology at the public library. 68% of respondents reporting using technology at the public library were over age 55. 63% of respondents reporting using technology at the public library identified as low income. 44% of respondents reporting using technology at the public library were introduced to a new technology. 52% of those introduced to a new technology were over age 55. 92% of those introduced to a new technology continued to use it. 84% respondents reporting using technology at the public library reported increased digital comfort with using one or more services. 91% of those were identifying as a visible minority. A 2018 Ministry of Tourism, Culture, and Sport funded study by the Nordik Institute and Algoma University created a toolkit for measuring the social return on investment of public libraries. These tools have now been released to all public libraries. This toolkit is designed to measure the value of public libraries and their role as community hubs, building capacity for healthy, resilient people and places, especially in rural, Northern, First Nation and francophone communities. The toolkit provides a step-by-step process to assess libraries’ social return on investment (SROI) within a holistic, cross-sectoral framework. Combined with economic ROI studies this represents what a properly resourced public library can accomplish for their communities. SOCIAL RETURN ON INVESTMENT (SROI): direct spending, direct benefits, and indirect benefits. The dollar re-spent into the community. Social Return on Investment of Public Libraries is huge. Libraries that have already done a study based on the Nordik Algoma University toolkit are reporting extremely large SROI – in multiples of 100’s and thousands of per cents per dollar for their community and their residents including First Nations. Digital content requires more space. 25% of Ontarians do not have access to the internet at home or work. Many only have access to the internet through more expensive digital plans on mobile devices. Other Wi-Fi options lack peripheral access and assistance. While everyone is taught to read in school, every generation did not have the training needed for digital literacies – especially in the context of e-learning, e-government, and other issue like online elections. Libraries have been providing space for these activities in digital classrooms to encourage the skills needed for access, learning, small business and entrepreneur support, employment and use of government services, etc. 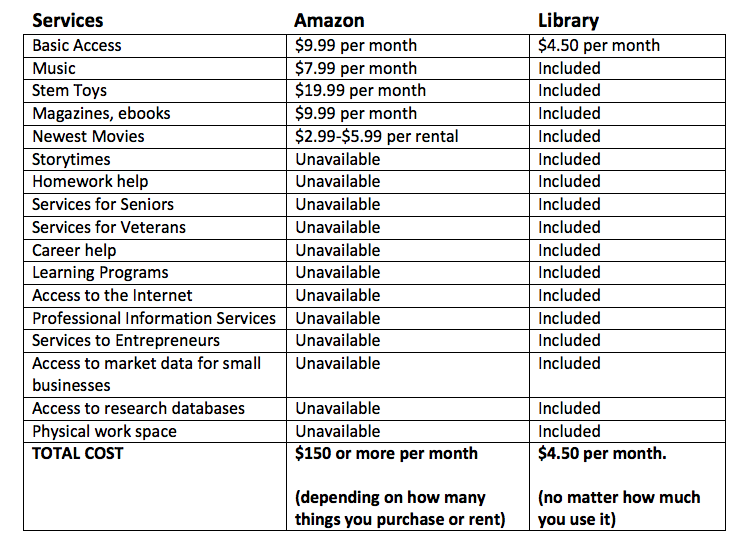 All of these issues and strategies militate towards larger spaces for public libraries in the 21st Century context. Again, the Public Library as Place or Community Hub strategies is an opportunity to engage in visionary city-building exercise that assures a great ROI and success. The decisions you make here will pay out for generations. Ensure that your impact has a positive swing. Decades of research by independent universities, research institutes, and consultants has delivered hundreds of reports and studies on the economic and social impacts of public libraries. There are too many to pepper through the report as the source of our recommendations but we have read and absorbed all of these. The following is a list of Canadian public libraries who have conducted an economic impact study applying the cost-benefit analysis (CBA) model first used by Toronto Public Library in 2013. CBA is a commonly used approach to estimate the economic impact of public institutions. Please read “Understanding Economic Impact and Public Libraries” for a more detailed explanation of how CBA is applied to public libraries. This list is maintained by Brightsail Research and Kimberly Silk, MLS. The data presented in these reports are in several forms and with varying levels of detail depending on the detail needed for different views. Now we will outline the variables and dimensions. This discussion of variables is brief and the reader is cautioned to realize that in each case where the variable is described as a higher ratio or lower ratio is ranked better that what is left unsaid is: “all other things being equal.” They are not and that is why we have more than one variable to give you the context to understand your library and its peers as the data describe them. Collection units per capita. “Units” is defined broadly. This is a measure of how big the collections are for the size of the libraries’ resident populations. Higher is better. Employees per capita times 1,000. This measure tells us how big the staff is to service the population. Higher is better. The calculation gives a small number and to make it easier to understand, we multiplied by 1,000. It can be thought of as so many people for each 1,000 in the resident population. Population per workstation. This measure tells us how many workstations the library has. By dividing the population by the count of workstations, we have a number which indicates, how likely a library user is to find an empty workstation. Here, a lower ratio is better. Consider: is it better to have 10,000 people per workstation or 100? Population per service point. Service points are broadly defined to include places where people will have physical access to the library. They can include bookmobiles, branches, and deposit stations. Again, a lower ratio is better. Is it better to have 10,000 users per service point or 100? This dimension has three variables related to the actual use of the library. Stock turnover is a traditional measure: how many times is each item (on average) checked out? Here total annual circulations are divided by a count of circulating items held. Higher is generally better. Circulations per capita is another well-known calculation. Annual circulations divided by resident population. Higher is better. Program attendance per registered borrower. How many of the libraries’ cardholders attend the libraries’ programs? The reported number in the detailed tables is 100 times the raw calculation. Total annual program attendance divided by the reported number of library cardholders. Higher is better. This dimension is new to the world of library assessment and it was created to get a handle on an important set of changes occurring in the library world: the modern library is not a passive organization waiting patiently for people to appear but one increasingly looking for opportunities to meet its public wherever they are and wherever they have information needs. The four measures in this dimension are an attempt to measure how libraries are adapting. Programs offered per capita. The higher ratio is better. Registered borrowers per capita. What percentage of the libraries’ resident populations have library cards? 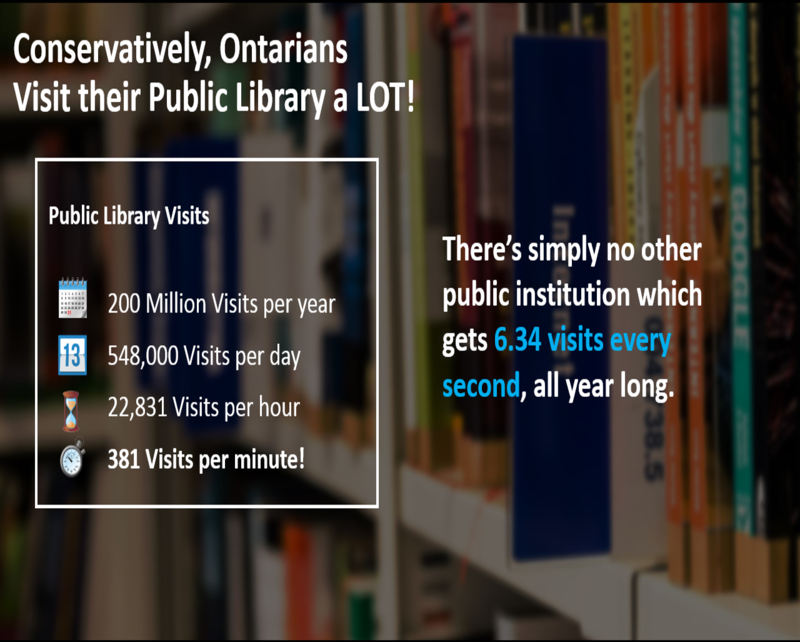 Higher is better but we have documented how this percentage has been declining in Ontario’s libraries. Hours open per capita times 100. Hours open includes not just buildings but bookmobile and deposit station hours. More hours open per person although as we know, a library’s electronic presence is open for business at all hours. Higher is better. Estimated Annual Visits per capita. This ratio is the result of a complex calculation. Visits are tracked as “Typical Week” data so the data presumably re for one week. The population is an annual figure so the visits were summed and then multiplied by 52 and that product divided by the resident population. This dimension occasionally works against the others. Service is better with more staff, money, and service points but more economical if these are balanced by care in allocating resources. It is always a matter of balance and by looking at your peer libraries, you can see how they made the same kinds of balancing decisions that your library must make. Collection expenditures per circulation. Lower is better. That is, more circulations per dollar spent is better than spending many dollars per circulation. Estimated Visits per open hour. Visits, again, come from “Typical Week” data and given that these figures and the open hour figure are both weekly figures, there is no need to do more than sum the number of visits and divide by the number of open hours. Higher is better: more people visiting is better than fewer people. Note that electronic visits are included and that these can occur when the library’s buildings are not open. Total Expenditures per estimated annual visit. Total operating expenditures of the libraries divided by the annualized visit figure to give an imputed cost per visit. Lower is better. It is better to have more visits per dollar spent. The attempt here is future oriented. Staff Training as a % of Total Operating Expenditures. This number is times 100 so these are the percentage figures. Staff training in this day and time is important but with library budgets being stretched, helping staff keep up with new developments by training or conference attendance is a difficult thing. But: higher is better. “Is your library board looking for a new way to communicate library value to your stakeholders? Ontario Library Service – North (OLS – North) contracted NORDIK Institute to create a measurement tool to illustrate the value of libraries in rural, Northern, First Nation, and francophone communities. A steering committee consisting of the CEOs of the six pilot communities participated in identifying the measurement topics, the design and testing of the tool. 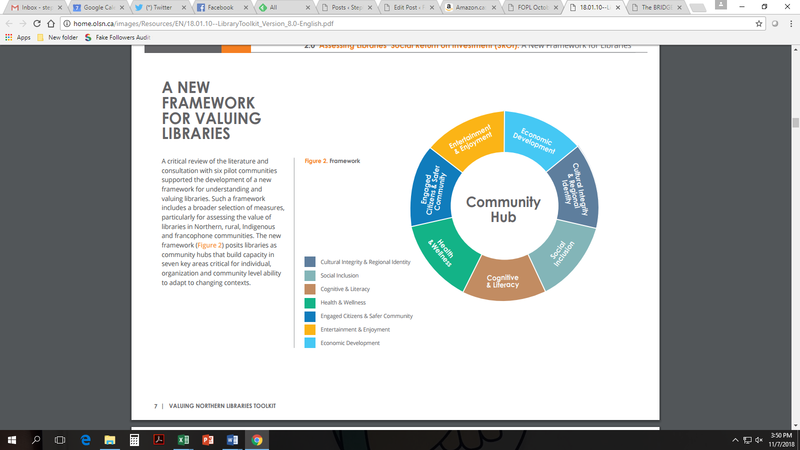 This tool is designed to measure the value of public libraries and their role as community hubs, building capacity for healthy, resilient people and places, especially in rural, Northern, First Nation and francophone communities. The toolkit provides a step-by-step process to assess libraries’ social return on investment (SROI) within a holistic, cross-sectoral framework. The Social Return on Investment (SROI) is a term describing the social impact of a business or non-profit’s operations in dollar terms, relative to the investment required to create that impact and exclusive of its financial return to investors. Based on a review of relevant literature, focus groups, consultation with steering committee members and site visits, NORDIK designed a measurement toolkit to encompass the many diverse and unique roles that public libraries play in the North as community hubs. This framework identifies seven areas where libraries contribute to building individual, organizational, and community level capacity. An indicator is a quantifiable measure used to monitor progress or impact in a given area or sector. In collaboration with the pilot sites, three indicators were chosen that best reflect how libraries’ operations and expenditures contribute to each respective area. The same number of indicators is measured in each of the seven sectors for the purpose of demonstrating the equivalent value of each sector in the overall economic benefit and calculation of its Social Return on Investment. While many of the services and activities of the libraries could arguably demonstrate benefits in multiple sectors assessed by the measurement tool, this study has relied on the preferences of the pilot sites to identify the placement of indicators most appropriate to each of the seven sectors. The indicators have been selected based on data that is collected by all libraries, or alternatively, can be easily collected during the ‘typical week’ usage survey. Each library builds a unique mix of resources—collections, programming, services, etc. in response to community needs, enabling diverse people to improve their quality of life and to participate in the life of the community in meaningful ways. In many instances, libraries demonstrate leadership by promoting services that are otherwise non-existent, under developed or under serviced. The library value toolkit can be used in all of Ontario’s small and rural communities to demonstrate how the library contributes to individual, organizational, and community capacity. The SROI Indicator Template will require some of the data submitted for the 2017 Annual Survey of Public Libraries, the Typical Week Survey, plus other commonly collected information. The Valuing Northern Libraries Toolkit online course will be made available on LearnHQ for Ontario public libraries to access. Assessing the ECONOMIC IMPACT of Vancouver Island Regional Library on our Member Communities, 2016. Building Burlington’s Prosperity: The Economic Impact of Burlington Public Library, 2015. Ottawa Public Library Impact Report. 2015. We offer customer reports of peer analyses that match an individual library’s needs. That is summarized in the main report. Lastly, we also compare ourselves on a national, US and international basis when data is available. Ontario libraries tend to come out very very well. In the US you have a few great data sets and projects including IMLS, NCES, PLA, Project Outcomes, (ARL, and ACRL data) and you use our Canadian company Counting Opinions well across the country. This is from the Annual collection of data from all libraries by the Ontario Ministry of Tourism, Culture and Sport. In general, every dollar invested in libraries generates over $5 in local, frontline economic impact benefiting regular Ontarians. Americans for the Arts. (2012). Arts & Economic Prosperity IV: Economic Impact of the Nonprofit Arts & Culture Industry. Washington, DC: Americans for the Arts. Fraser, B. T., Nelson, T. W., & McClure, C. R. (2002). Describing the Economic Impacts and Benefits of Florida Public Libraries: Findings and Methodological Applications for Future Work. Library & Information Science Research, 24 (3), 211–33. FOPL has been investing in research on our members’ behalf. FOPL funded this independent academic study that shows the role and impact of public library children’s storytelling programs. It’s a very positive study about the public library’s impact on our community’s kids for early literacy and school readiness! Who could argue with that! Story times aren’t merely fun, songs, dances, and games. Every parent invests in their children and public libraries play a key role. 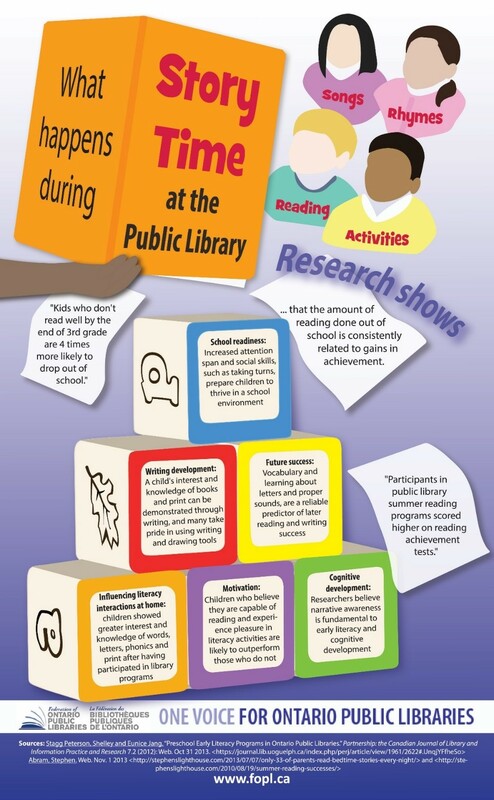 Briefly, the report shows that your library’s story times improve school readiness, vocabulary development, motivation to read, narrative awareness, phonological awareness, and print awareness. Indeed, these programs change children’s literacy behaviours at home and parent’s literacy interactions with their children. The report contains a number of important recommendations for you. As a core program of public libraries it is wonderful to have this piece of Ontario-based research to focus on building even greater success. We also created an infographic about this research, “What happens during Story Time at the Public Library”. We hope you feel that this is good enough to post in your library for staff, parents, and your cardholders. Thank you to Susie Benes for a great job creating this internally. A French translation of this report will be available in the coming weeks and will be mailed to our FOPL French Caucus members and posted here. Additional copies of our infographic will be available at the OLA Super Conference. I hope you find this report useful and worthy of sharing with staff, trustees and the public. It’s great to have an independent piece of academic research showing the positive value of what public libraries do every day for our communities. An infographic created by FOPL which summarizes the information found in the report “Preschool Early Literacy Programs in Ontario Public Libraries”, which can be found here. You can download the infographic as a pdf or jpeg. There are a number of leaders in this field of research including Ross Todd, Keith Curry Lance, Ken Haycock, David Loertscher, Stephen Krashen, Ann Curry, and others. All are great soldiers in this battle so reading their sites, reports, and blogs is helpful. Here is a position paper from Rutgers University’s Center for international Scholarship in School Libraries, that discusses the relationship between school libraries and student achievement. School libraries seem over challenged lately and that’s not fair. It verges on insanity. It also risks future generations. I hope these studies help to arm ourselves for the battle. Advocate for your libraries, our libraries.